← Why Did It Go? Is There A Need For A New Marathon Club? The motto – or ‘mission statement’ if you like! – of the SMC was simply ‘to foster marathon running in Scotland’. And right well it did it. So what happened to it? Alistair thinks that with all the marathons in the 80’s, there was no apparent need for it and it just withered away. It would be interesting to speak to one of the members of the last ever SMC Committee to find out exactly what happened. If there is one lesson to be learned from history it is that no situation lasts for ever. Ozymandias of Egypt, anyone? Things tend to go in cycles. What is fashionable today will be out of fashion tomorrow and back into fashion the day after that. What is the situation today? As far as the marathon in Scotland is concerned, it is dire. Extremely dire – the huge promise shown by Andrew Lemoncello disguises a situation that the hierarchy at scottishathetics does not wish to acknowledge. I should qualify that as we have a new hierarchy and there will probably be changes made which I hope, but I’m not holding my breath, will include the marathon. If we go back to the 1980’s what is the picture? 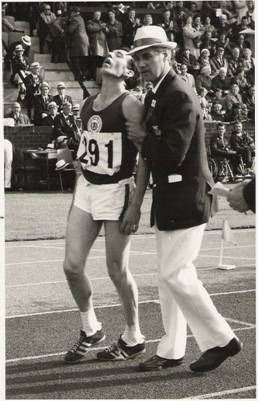 It is maybe necessary to ask ourselves whether it is fair to compare ourselves to the best period ever in Scottish Marathon running history – and my response is to say, if we want to be the best we can be, then we must compare ourselves to the best that we have been. Would it be fairer to compare the current standards with those prevailing in 1946 immediately after the War with rationing still in force, athletics clothing in short supply and few races on the calendar? Of course not. If we want to be the best we can be then we compare ourselves with the best that we have been! In 1982 there were 81 runners inside Scotland running 2:30 or faster and most were done in Scotland with 22 performances inside 2:20. In 1983 there were 122 Scots inside 2:39 for the event and 29 performances inside 2:21. Fraser Clyne ran 22 marathons inside 2:20, the Don ran 24 (and that includes after his 45th birthday!) and Colin Youngson with many sub 2:20’s to his credit says that it was a constant quest in marathons to get under that time. And now there are none! If these men were gold dust in the 80’s …………. is there such a thing as platinum dust to evaluate their worth in the twenty first century? Even if we accept the argument that these figures are too high to use as a target, the let’s go back to the 60’s. In 1966 there were six men inside 2:30, in 1967 there were five inside 2:20 and a further six on 2:30 or quicker and in 1968 there were three inside 2:20 and and another three on 2:22 or quicker. Last year (ie 2008) there was a Scotsman from Tipton who ran 2:19 in Florence and he was the only Scot inside 2:20! There were 6 (SIX) inside 2:30 if we count him in. The fastest time run by a Scot in Scotland last year was 2:29:57! There were only 19 inside 2:40 anywhere in the world. And that was not an atypical year = the previous year NO Scot ran inside 2:30 inside Scotland and the year before that only one did. All the spin from the Gyle doesn’t alter that fact. A few years ago Peter McGregor asked at a Conference whether any Scot would make the Commonwealth Games qualifying standard and was met first of all with a patronising silence and a dirty look, then he was told that six Scots including Glen Stewart, Allan Adams, Simon Pride and others would get the time. Well, none of them did. And even if any of them had, it would indicate only that one or two men had run a quickish time not that the event was well in Scotland or that there was any one who could lace the running shoes for Allister Hutton, Fergus Murray, Donald McGregor, John Graham, Jim Alder or any of their contemporaries. The event is sick in Scotland just now and the Gyle doesn’t seem to have a plan to resurrect the corp. There is a need for a clear plan for the event and the old SMC would have filled the bill very nicely! What could a new marathon club – or scottishathletics marathon sub-committee – do? Well in the first place they would be responsible for the one event, responsible only to themselves and would all be enthusiasts. I sympathise with the current endurance coach who is responsible for all events from 800 to marathon, both men and women plus race walking and steeplechase plus marathon plus adherence to guidelines and an unsympathetic hierarchy whose aim is medals rather than the event – they would rather have a medal in the Commonwealth Games than 20 men inside 2:20! They would start from the old motto of fostering marathon running in Scotland but adapting the means to that end to the twenty first century. .On the first page of their book “A Hardy Breed”, Fraser Clyne and Colin Youngson make the point that it was only through the work of the SMC that the Scottish Marathon Championship was started at all and further that it was through their efforts that it was included in the SAAA Championships. Both were significant – by having a championship, they gave the runners a target and gave them status equal to other athletic events. By having it held in the national championship meeting they gave it a place on the national stage – parity of esteem with other events. Contrast that with today’s situation where the event is hired out to whatever marathon makes the highest bid, on a course not necessarily geared to fast running and in a field that makes the national championship of Scotland a sideshow! Nice warm words but what would the targets be? 2. The entry fee for a marathon race should be kept as low as possible to enable people to run. 3. Make the Scottish Marathon Championship as fast a race as possible, not by limiting the field but by selecting a course that is flat enough and sheltered enough to make such times likely. And make it clear on the entry form that the officials will knock off after three and a half hours! 5. Reward good performances with invitations to other races in other parts of the country or even in Europe. 6. Make it easier for folk to step up a distance by really trying to get races at all the intermediate distances that seem to have fallen by the board. Any other suggestions for improvement??? I’ve a very open mind.